The very same week we were having our new treehouse built, the fine folks at Epson sent an e-mail out of the blue wondering if I’d like to test drive a neat new home theatre projector. 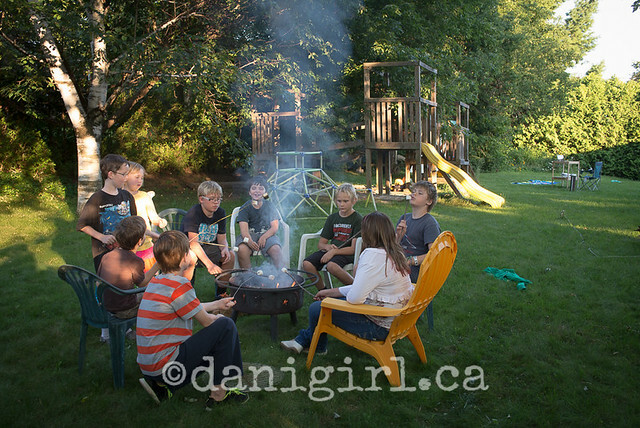 I immediately imagined a big white bedsheet tacked to the treehouse, friends and neighbours gathered ’round on lawnchairs on a warm summer night, crickets chirping and kids sitting on blankets munching popcorn under the stars. It was the vision of a perfect summer night – and for once in my life, that’s exactly how it played out! 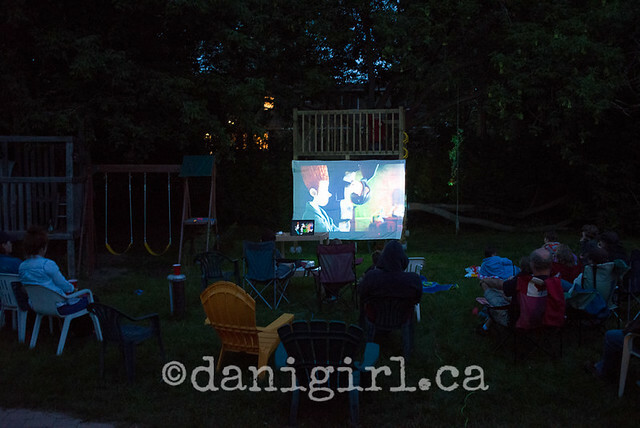 A backyard movie night and tree-house-warming party for just our family and my visiting brother’s family would have been awesome on its own, but I thought it would be a great way for us to get to know our neighbours a little better. Although there are quite a few kids similar in age to the boys on our street, they go to a different school and it drives me a little crazy that even though I know the adults well enough to say hi and chat, the kids on the street don’t know each other like they did when we were kids. Movie night seemed like a great icebreaker. To round out the crowd, we invited a few of the families of the boys’ friends from school and a few family friends, too. I’d say we had probably a dozen or 15 adults and maybe 20 kids. Way too many people for the inside of my house, but perfect for the sprawling yard! Get ready for a standing ovation from family and friends when you share brilliant 2D and 3D entertainment using the Home Cinema 750HD projector. Transform the game room, garage or even your backyard into an incredible big-screen experience — all at an affordable price. 3000 lumens of colour brightness and 3000 lumens of white brightness1 and 720p resolution ensure images are bright, sharp and clear. Quick and easy HDMI connectivity lets you jump into the middle of any 2D or 3D adventure, from movies to live sporting events and even video games. Get the total package with rechargeable RF 3D glasses and an internal speaker — all included, so you’re ready for larger-than-life, immersive, 3D adventures — anytime. Epson’s exclusive 3LCD technology delivers rich, vivid images up to 300 inches — perfect for projecting on a blank wall or portable screen. The forecast for Friday had been perfect, then sketchy with a 40% chance of thunderstorms, but if there’s anything the summer of 2013 has taught me, it’s to ignore the forecast entirely. As it turned out, the night was clear and perfect and the only real problem was the skeeters. I was worried we’d have to wait until full dark to be able to see anything. (We saw the original Batman at the drive-in back in 1989 or so, and I remember not being able to see anything for the first half of the movie because it’s such a dim movie to begin with, and in the ambient light of the setting sun, we couldn’t make out any of the details.) I was really impressed at the power and clarity of the Epson projector, though. 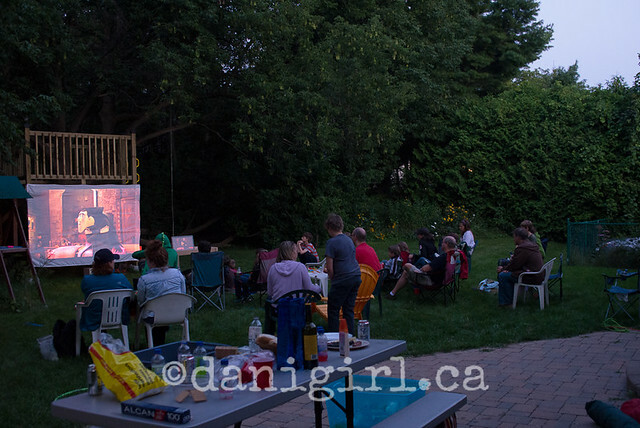 It was just as the sun was setting that we started up the movie, and it was crystal clear. Of course, the effect was better as we approached full dark. Look how crisp the image on the screen is! I was so impressed! We didn’t get the chance to try out the 3D mode yet, but we’ll still have the projector for a few days before we have to return it, so we may have to try that out tonight. Beloved is completely in love with it. He leaned over to me half way through the movie and said, “We so need one of these. I want to watch all my favourite TV shows like this!” I laughed imagining Survivor and Survivorman projected on the treehouse, but I think what he had in mind was setting it up on a shelf over the bed and projecting the full size of the bedroom wall! Everyone agreed it was a great night. Huh, lookit that — some of my crazy schemes actually play out exactly as I imagined them. Who would have guessed it? Previous post: A new Ottawa toy store and a giveaway!